Team Talk. Bank Holiday. YES! With Dulwich Hamlet not in action until 3pm, I sensed an opportunity to get in a morning kick-off before heading to glorious Champion Hill. Lots of juicy ties on over the bank holiday, none more so than a gritty Step 5 match-up between two stalwarts of the Combined Counties Premier. 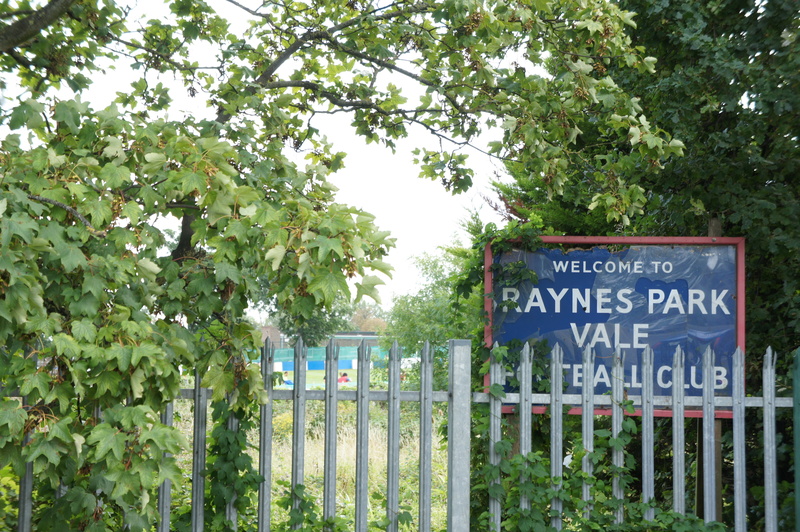 Raynes Park Vale (affectionately shortened to both The Vale and/or RPV) are the product of a mid-90s merger by two clubs, Raynes Park F.C. 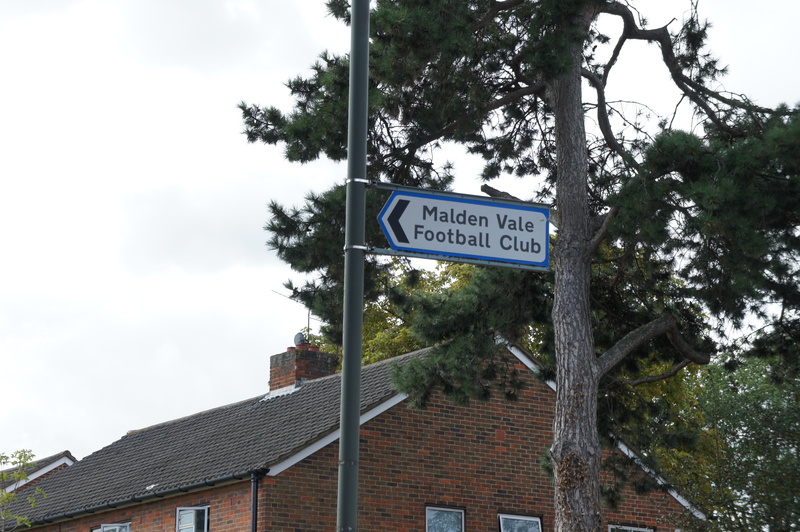 and Malden Vale F.C. 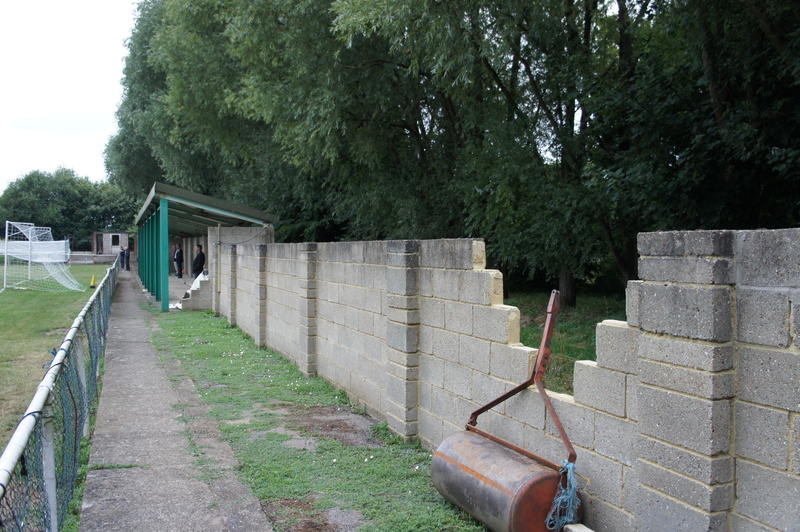 Malden Vale, the more successful of the to sides, have the honour of being the last ever winners of the Surrey Senior League in 1978 before the league vanished in a reorganisation and emerged as the London Spartan League, a league in which they finished 4th twice and 2nd twice, most disappointingly in 1984, when they lost out on the title to Hanwell Town on goal difference. Vale then left for the Combined Counties first incarnation and at the first attempt, won the title. The only league title on either side’s resume. 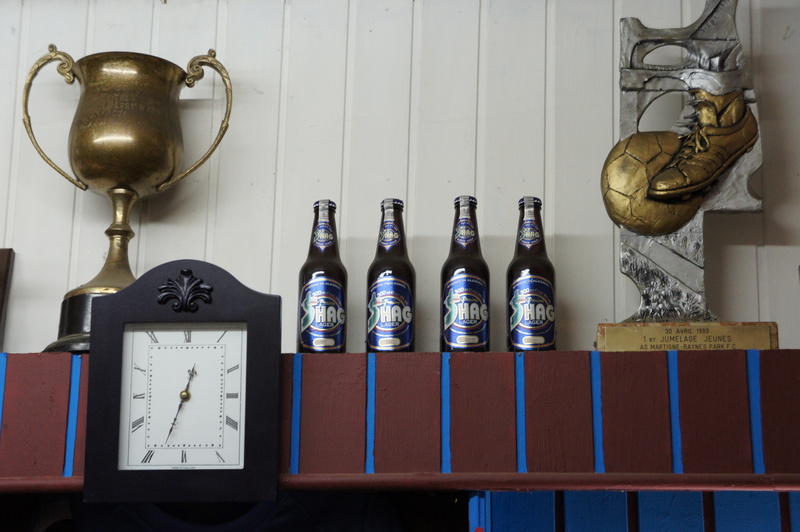 Malden Vale also have the slightly richer history in terms of former players. Former Irish international Clinton Morrison and current St Johnstone legend in the making, Jody Morris, both started out their careers in Malden Vale. 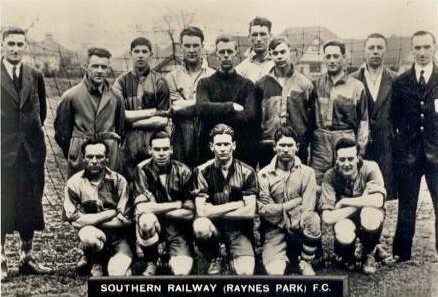 Raynes Park were formed off the back of the old Southern Railways (Raynes Park) an old works team. Sadly little is known about these sides other than Railway had success in the 1932/33 Middlesex League and were also double winners in 1936, taking home both the Railway Athletic Association Cup and the Southern Railway Orphanage Cup. 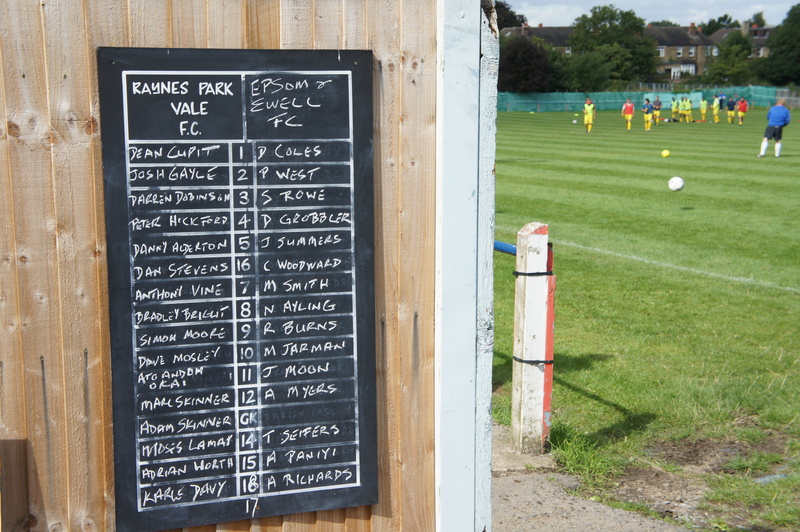 Raynes Park Vale’s opponents were fellow Surrey-ites and promotion hungry, Epsom and Ewell, a team/ground we’ll be blogging in future. Park the bus. Raynes Park Vale play at Grand Drive, original home of Malden Vale and in no way connected with the late-90s band of the same name (who, with ex-members of Goldrush now perform as Danny and the Champions of the World for those of you interested in that sort of thing). 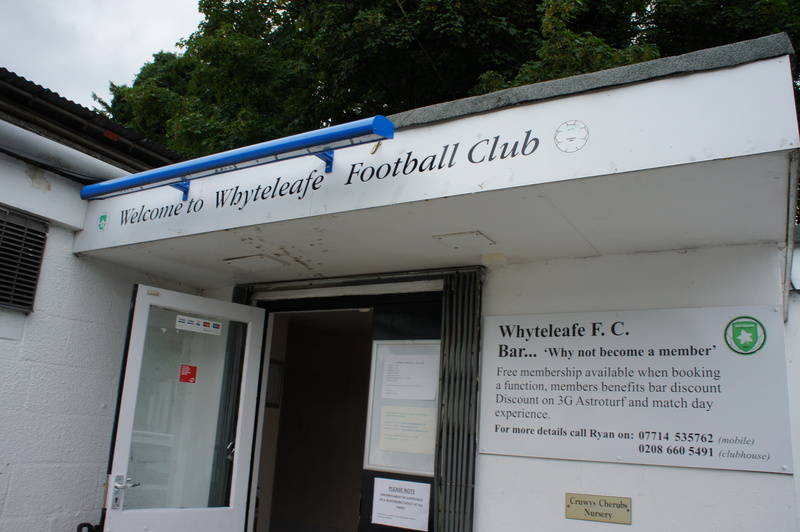 The stadium is a 5 minute walk from Raynes Park Station, a 25 minute ride from Waterloo or 15 from Clapham Junction. The ground is off Grand Drive itself and is located up a track which runs parallel to the stadium. Parking is limited so avoid the “Road Music”if you can (I’ll stop now). 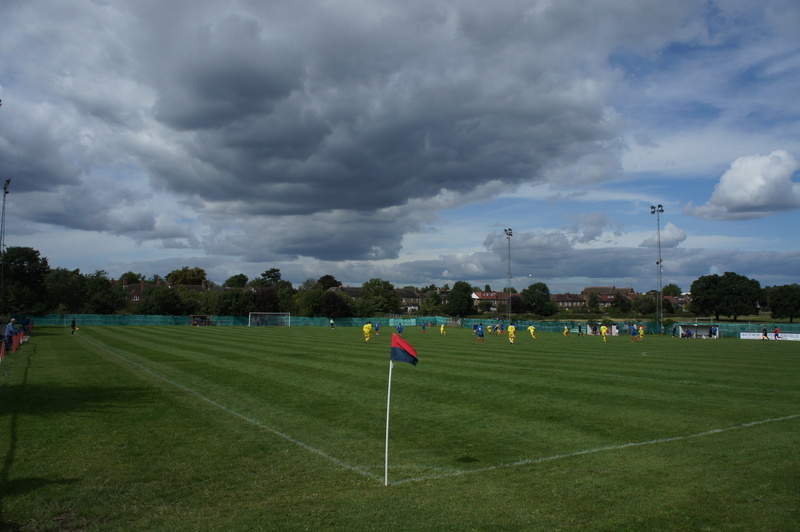 Home Advantage.Grand Drive is a rather reluctant home to Raynes Park Vale. 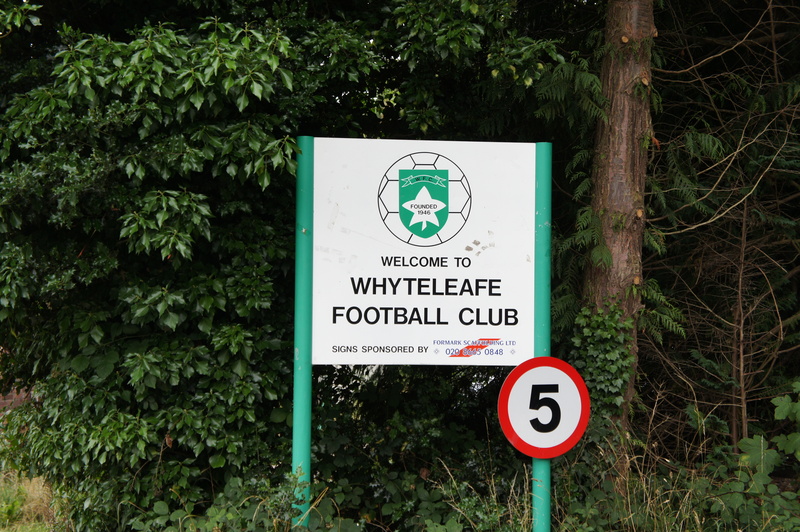 The departure of Wimbledon to Milton Keynes hurt more than just the Dons, it also hampered Vale’s hope of finding a new ground. 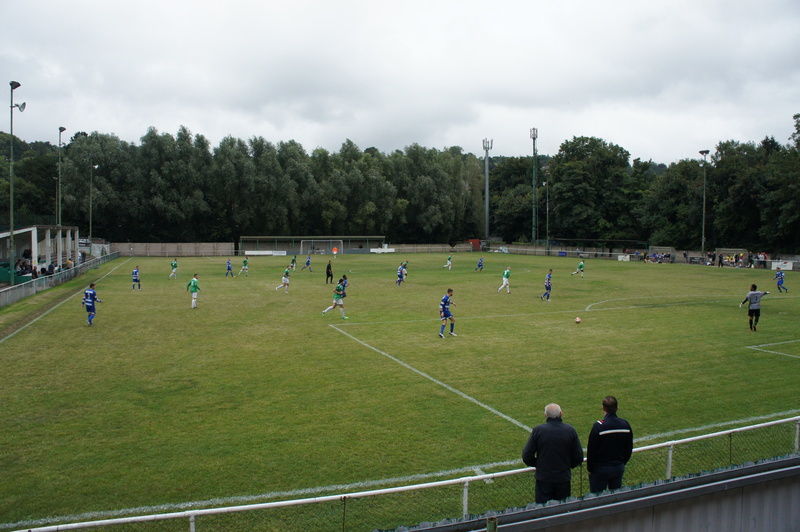 The current stadium, together with the rest of the Prince George’s Fields sports pitches was set to be bought out by Wimbledon F.C. for their new youth academy. 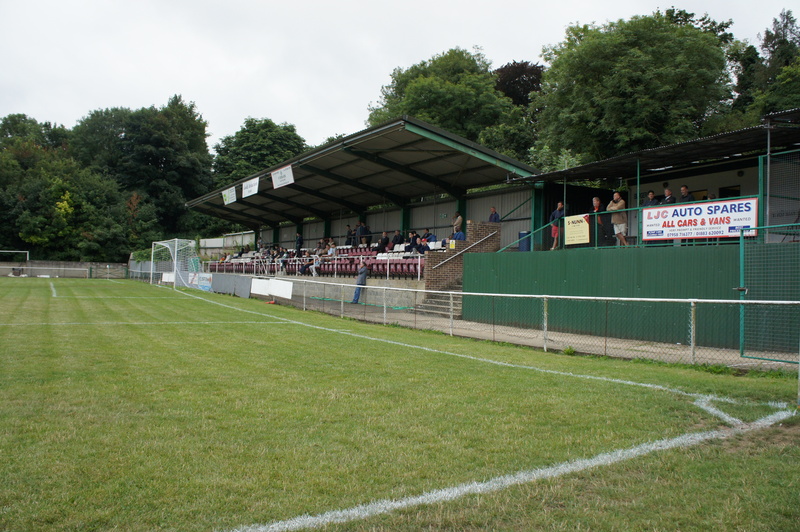 However, thanks to arch-chuffers, Sam Koppell and Pete Winkleman, the planned facility was eventually built in-between roundabouts somewhere in Buckinghamshire and Vale continue to ply their trade in the corner of Prince George’s Fields. Whilst Vale seem somewhat aggrieved by this, most likely because of the financial burden of the lease, I have to wonder whether a move away would be of much greater harm. 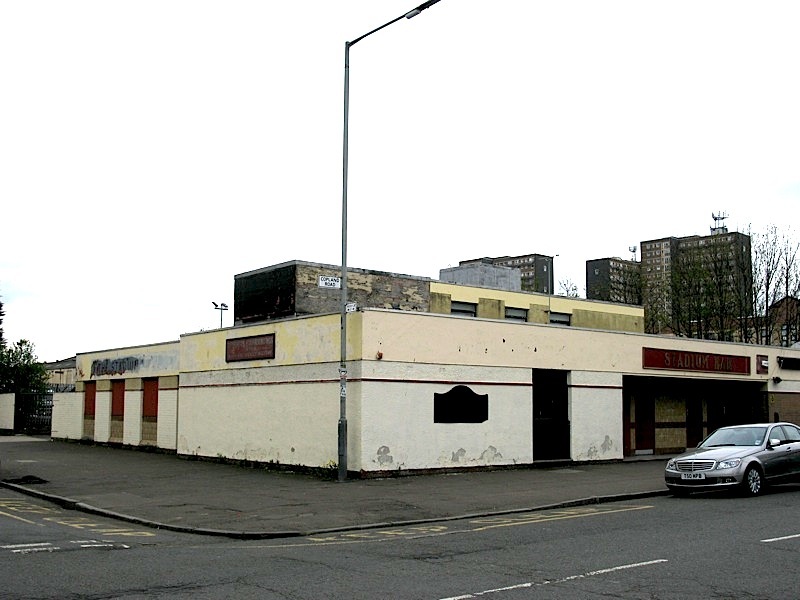 Certainly a new stadium would be a bit more state o’ the art but it wouldn’t have the faded charm of Grand Drive. 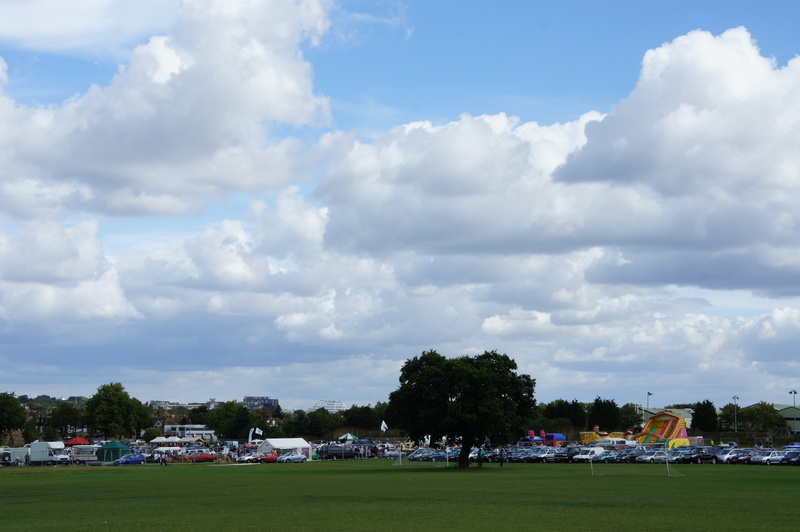 Cars, as far as the eye can see. But are they here fore the Vale? The ground has fallen into a state of slight disrepair, even by Combined Counties standards and I fear would require some pretty serious work to get it up to Step 4 requirements. However, it’s still got a lot of character. 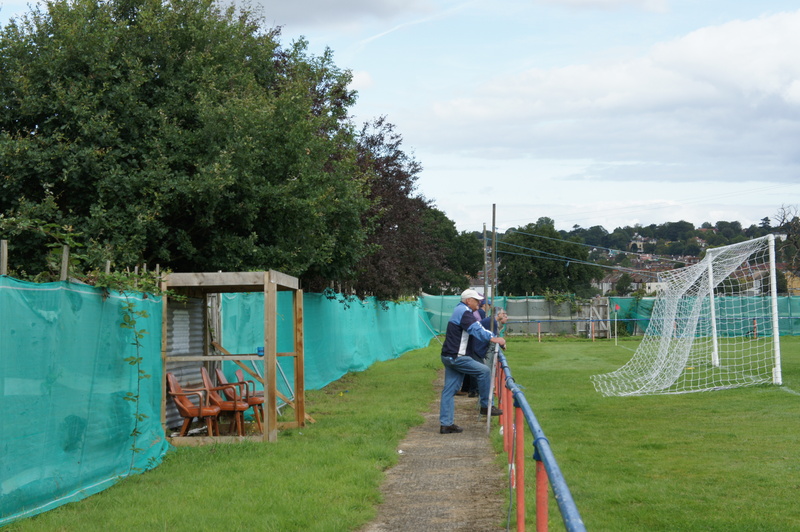 The blue and red railings were a particular highlight and was a further sign of the ease at which many clubs can pimp their ground in team colours if they wear something a little less dapper and it’s always a pleasure to see a chalkboard for the team line-ups. However, the first thing you notice as you notice as you enter through the kiosk is that ridiculous grade of the pitch. There must be a clear 2m from the bottom left corner to the top right. It’s not the north face of the Eiger but you’d still be able to have a mighty competitive cheese-rolling contest and it was evident that it has an influence on play. 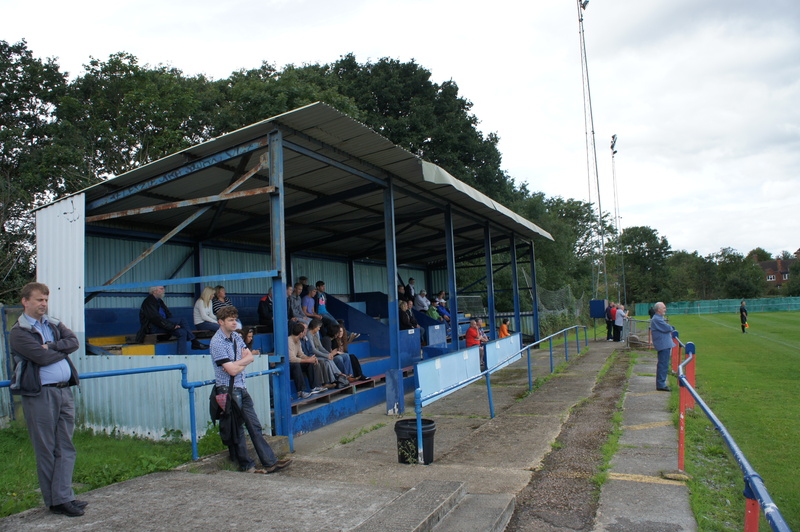 In terms of structures, there is one covered stand which features nice old-fashioned wooden bleachers as well as stands (of sorts) at both ends. 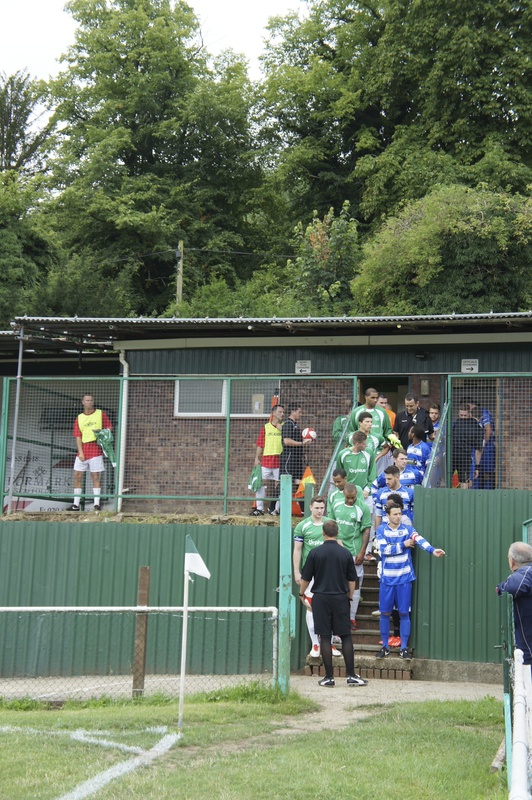 It also featured the obligatory director’s box for the visiting officials. This was about the only corner of the stand I didn’t attempt to sit in but the other four or five vantage points I tried all provided obstructed views of one or both goals, resulting in some serious giraffing and making it the only all-restricted view stand I’ve sat in. Luckily other options were available. 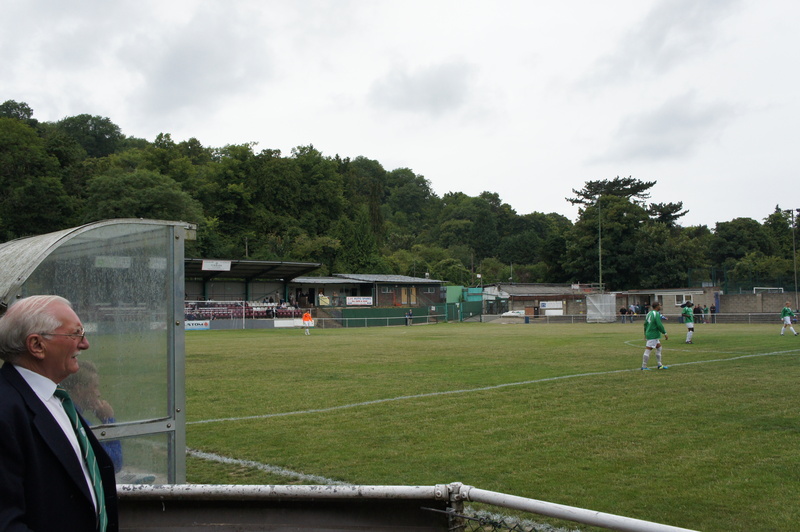 Although, the conventional pigeon stand located behind the goal at the top of the hill was looking rather worse for wear and not something I would chose to shelter under unless absolutely forced to. Judging by the collection of rusty barbeques which seem to be stored there, few others fancy watching the game from there either. After wandering down to the bottom of the hill, I can see why. Opulence, thy name is Raynes Park Vale. 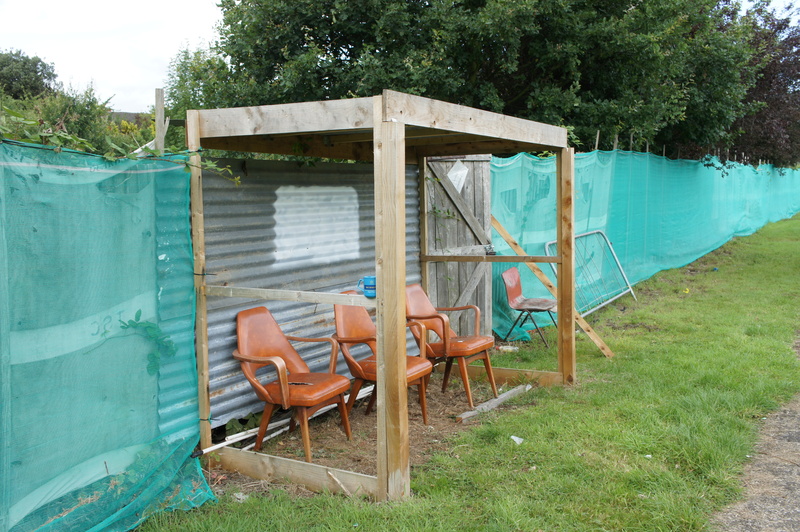 A three-man “executive” enclosure with leather, yes LEATHER armchairs for the delectation of even the most discerning lower league connoisseur. It even seems to come complete with mugs of tea, genuine MUGS. Full of life-giving tea! Amazing. Why is nobody having a seat?? Watching Vale. LIKE A BOSS! 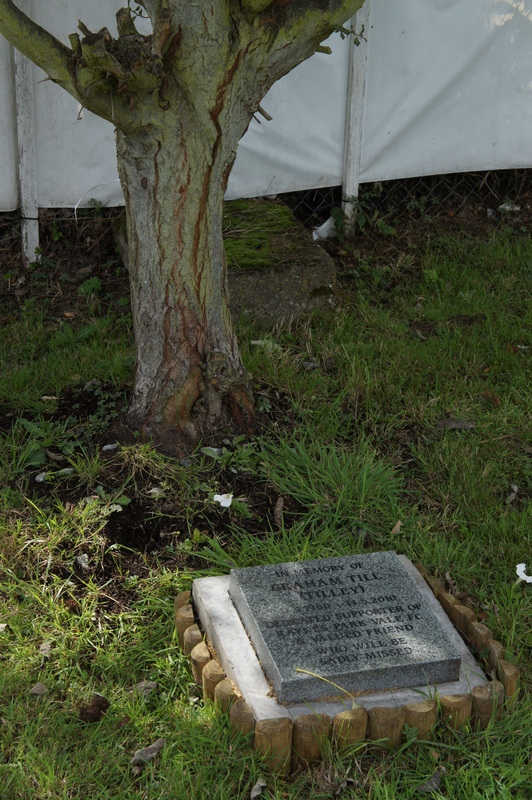 A noteworthy feature was a tree dedicated to one of the Raynes Park faithful who had died last year. A much nicer tribute than a bench or seat in the stand, especially if they use the pruned branches to build another executive stand. Prawn Sandwiches. 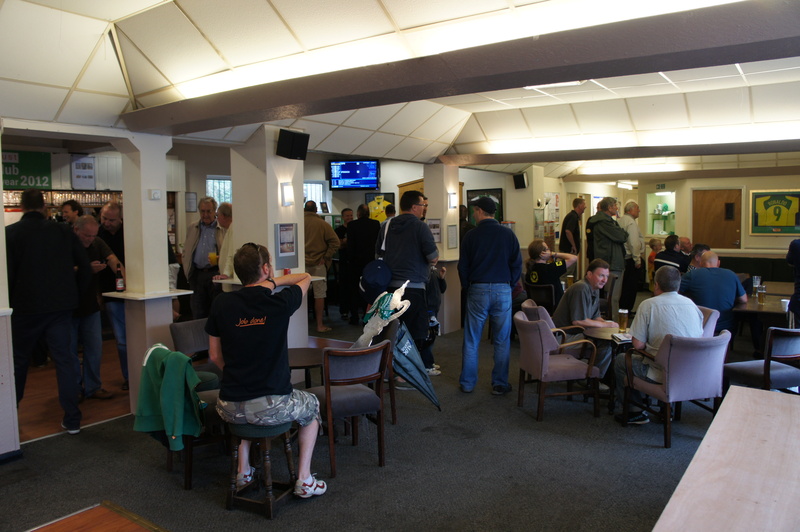 Despite taking the form of a Scottish housing scheme boozer, the clubhouse was a nice, yet functional space with pool table, dart board (a rare find in London these days) and telly, although Magic FM was the order of the day. 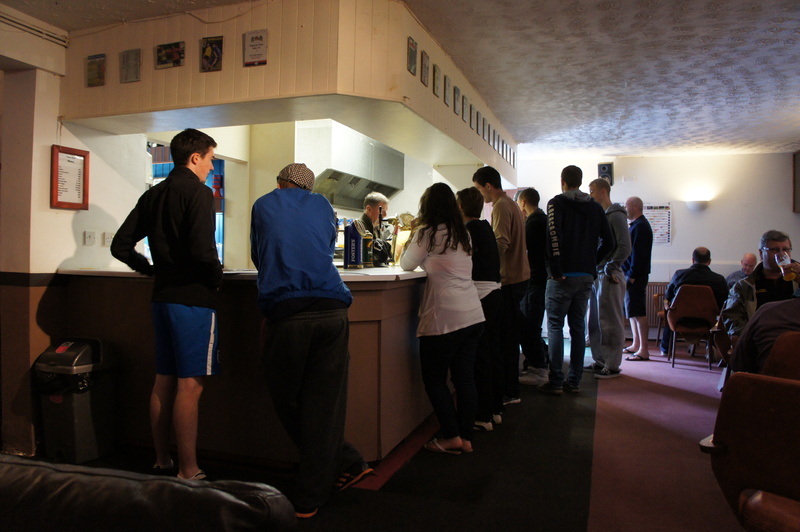 The bar has a number of framed programmes of big Vale games as well as pennants from visiting sides. Oh and a collection of comedy Shag Lager. As it happens, getting a Shag from the barman was the last thing on my mind. With the early kick-off, breakfast I needed breakfast. 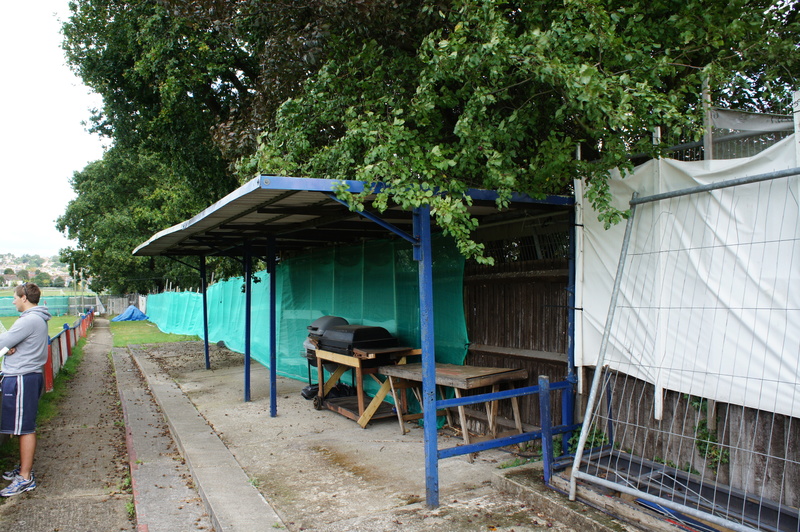 Irritatingly, bacon rolls were harder to come by at Grand Drive than they were at the wonderfully Jewish, yet understandably cloven-hoof-free, Wingate and Finchley F.C. (well worth a visit, by the way). A small corner of the bar was dedicated to tea and hot goods but sadly only frozen burgers were on offer, these were simultaneously defrosted and cooked on a large George Foreman grill. I chose not to partake. A mug of tea was an inviting 50p and impressively came from a teapot. A magnificent touch. During the 15 minute interval, I had a chat with one of the visiting support who seemed like a jolly chap and seemed to take an interest in the Pigeon Stands experiment, even asking for a note to the website (if you’re reading this, welcome Dundee Dougie). Despite my obvious bias to fellow ex-pats, he and his pals seemed like a pleasant bunch and I’m certainly looking forward to a trip to Epsom and Ewell in the near future. 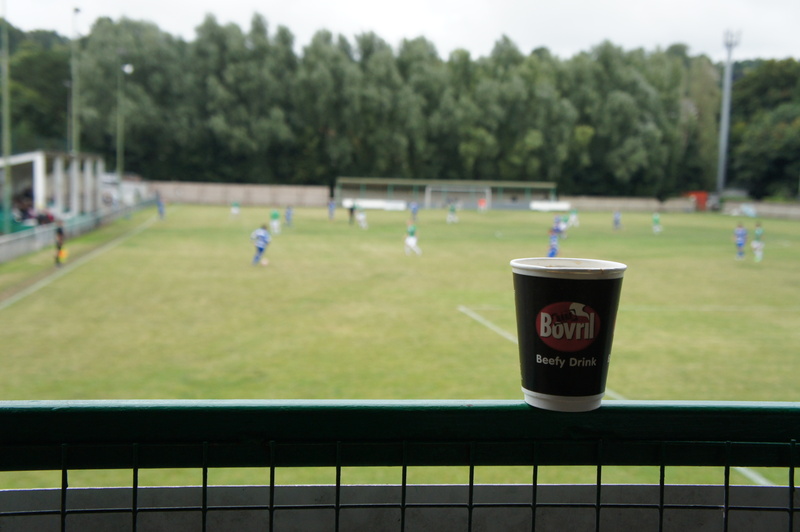 The home support largely took the form of stewards, barmen and tea-ladies so there was scant opportunity for any interaction with them. Those who weren’t helping out in someway seemed accommodating enough though there was an odd mutter about the early kick-off time. …and the game. Fantastic quality on show today as both sides played out a really good game. Epsom have a good history in the Combined Counties and are a side who many think stand an outside chance of promotion (although most of us still fancy Guildford). 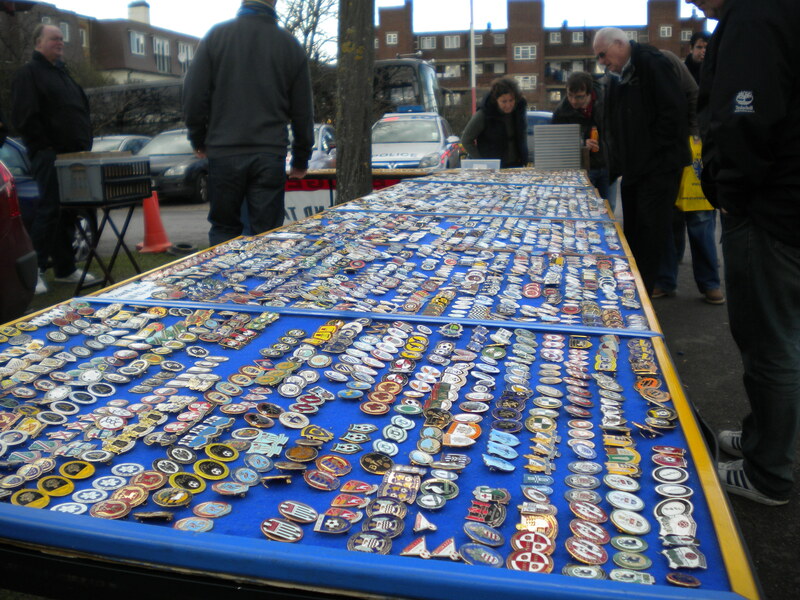 They undoubtedly had the physical edge and for the most part seemed well organised. However, they did look prone to the odd howler. 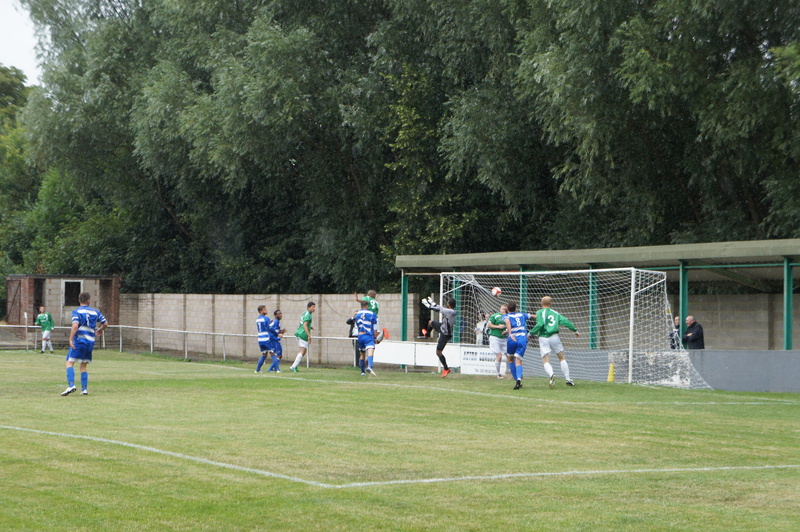 They opened the scoring after 10 minutes with a bundled effort after a corner. 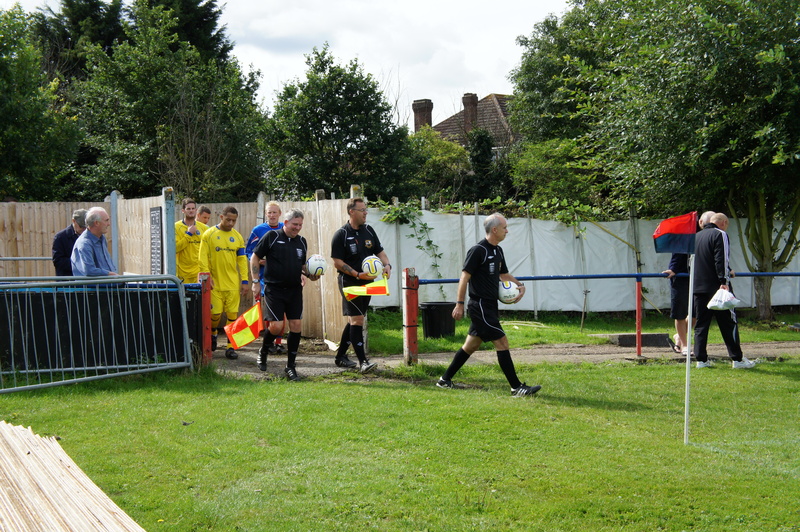 RaynesPark slowly came back into the match and pulled level after half an hour when Raynes Park keeper, Dean Cupit, cleared his lines with an almighty hoof up the pitch which star of the show, Simon Moore, latched on to. Poor defending at set pieces cost Vale again when a headed goal from another corner. Vale continued to press and Simon Moore was sent clean through for a second and third time without being able to find the net. 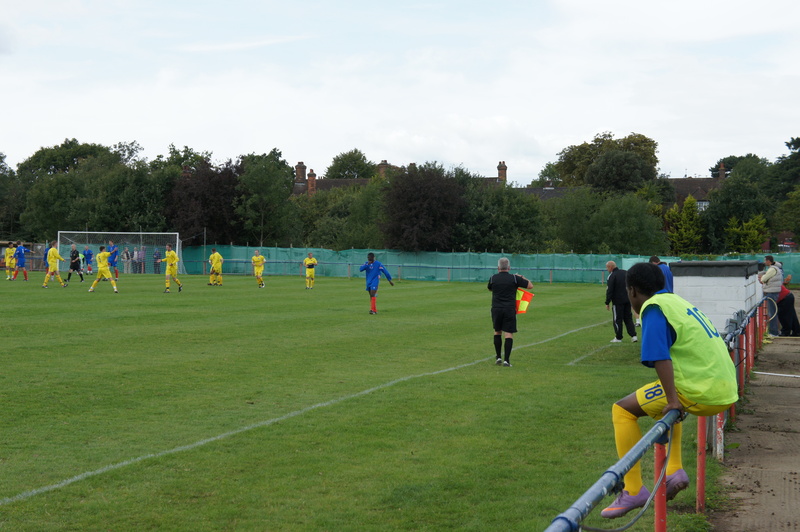 In the second half and played some very intricate passing football, sadly, not all of the players hooked up to it but massive credit has to go to Raynes Park gaffer, Lee “Dobo” Dobinson for trying to improve the young talent at his disposal. Not bad for a man who lists his former clubs as Café Mango’s, Legends and Footlights. 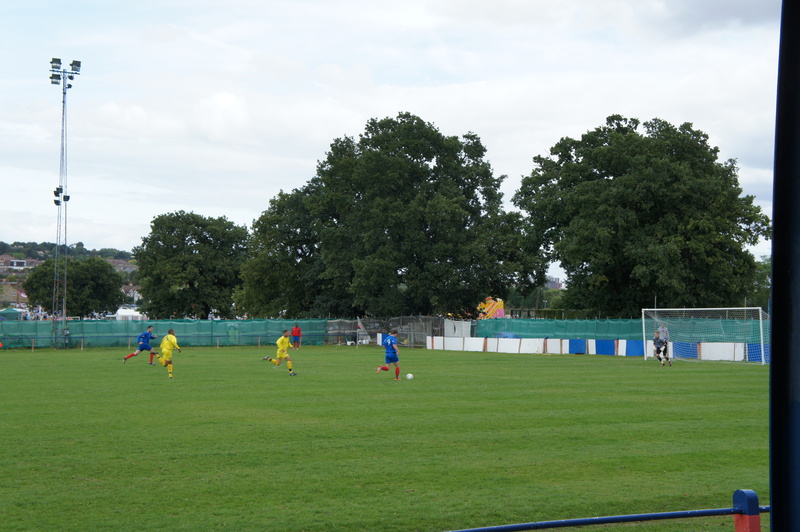 The Raynes Park equaliser came midway through the second half after a comical back-pass was snaffled up by Moore as he netted his second. The winner – and best goal of the game – came with three minutes to play as a long, Delap-esque throw was flicked on for Moore to claim his hat-trick with a spectacular volley across the face of goal in into the corner of the net. However, the most spectacular moment in the match came some 10 minutes into the second half when out of nowhere, the peaceful Zone 4 suburbs were shattered by an unseen and deafening roar of some sort of vehicle. Too shrill for a car but too deep for a plane. It was grotesque and mysterious, the players were confused, the officials were confused, heck, even us fans were confused. After maybe a 30 second deafening, play resumed with the background music of ear-melting engines. 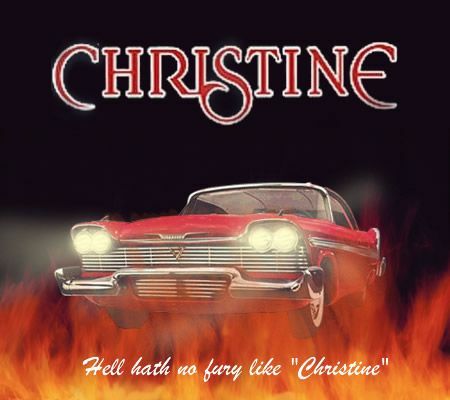 My fears of a Christine-style murder car or worse, Mr T in a tank, were allayed as the fairground in the adjoining field turned out to be a drag-racing show. Man of the Match. Tough one this. Usually there’s a clear off-field stand out. Today that wasn’t so much the case. As you can tell, I’ve written quite a bit about the game itself and without a doubt, the star of the show was on the pitch. However, in good tradition, our award goes to the multiple volunteers who keep Grand Drive ticking over. 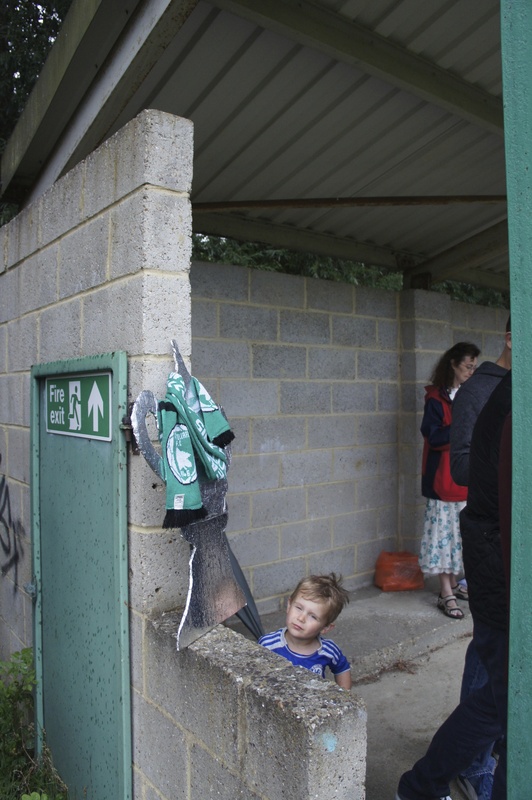 There may not be an army of supporters in the stands but there’s a solid troop of jovial helpers who man the turnstiles, fetch the balls from over fences and serve behind the bar. They are supporters in the truest sense of the word and at Grand Drive, like at thousands of grounds across the country, they keep things going. Worryingly, many of these souls seem to be in their twilight years and at Raynes Park, I worry about what happens in 20 years when these people can no longer continue. For now though, we salute those who give up their weekends, bank holidays and evenings for the enjoyment of others. Nice one! Post-match rub-down. 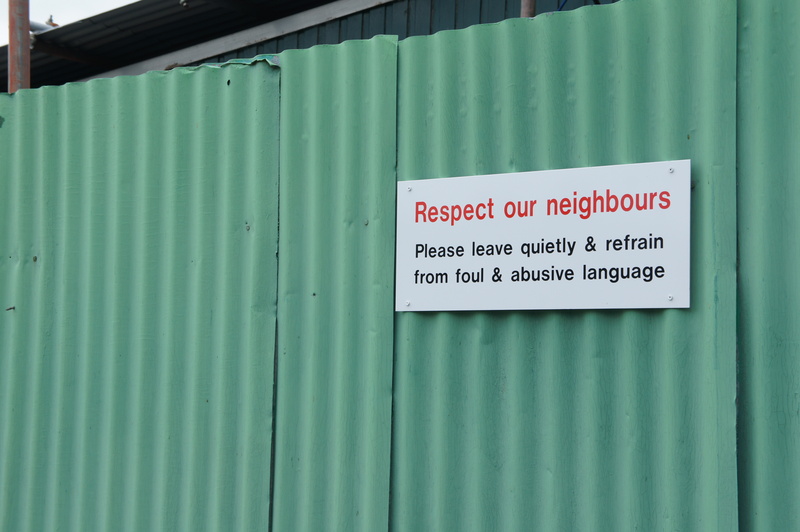 As I conclude this latest tale from the pigeon stand, I’m left feeling I’ve been a little harsh on Raynes Park Vale. Granted, it wasn’t a day of great whimsy but it was still a grand day out and importantly, it was full of splendid football. 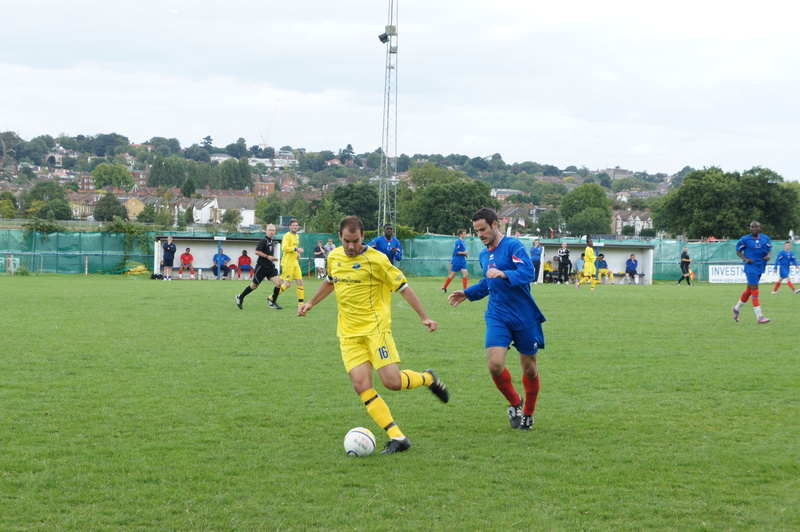 Both sides played some good stuff and in particular, Raynes Park, thanks to the intrepid coaching endeavours of Lee Dobinson. If implemented with a bit more pace and finesse Vale could prove very effective both in the Combined Counties and above. Next week’s FA Cup prelim with Faversham will be an excellent encounter and well worth checking out.